I’m so excited to share with you this simple but amazing blueberry sauce. This recipe is very similar to the cranberry sauce recipe I shared on the site months ago, but make no mistake, this blueberry sauce does not take a back seat to no other. 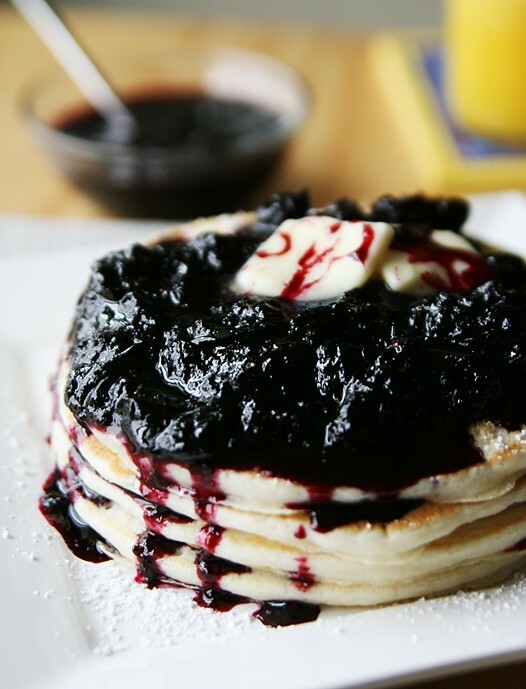 My breakfast today went from ordinary to extraordinary when I spooned this warm blueberry sauce over my stack of pancakes. I could not help but feel so spoiled while eating it. I can’t explain in words how awesome this simple blueberry sauce really is, you will just have to make it yourself to understand why I love it so much. Trust me, if you pour this warm sauce over pancakes you will feel like you died and gone to heaven – that good. Best of all, this recipe is ridiculously easy. If you cannot cook and you make this for your friends and family, they’ll suddenly think you’ve gone gourmet on them. You know what the best part about this recipe is? I used frozen blueberries!! 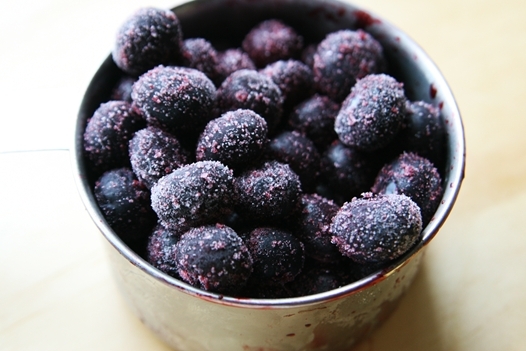 You could easily use fresh berries but in this case frozen blueberries really work beautifully. This sauce would be perfect over pancakes, french toast, blitzes, crepes, cheesecake, ice cream, or any recipe calling for a fruit sauce. I highly recommend serving this sauce while its warm. 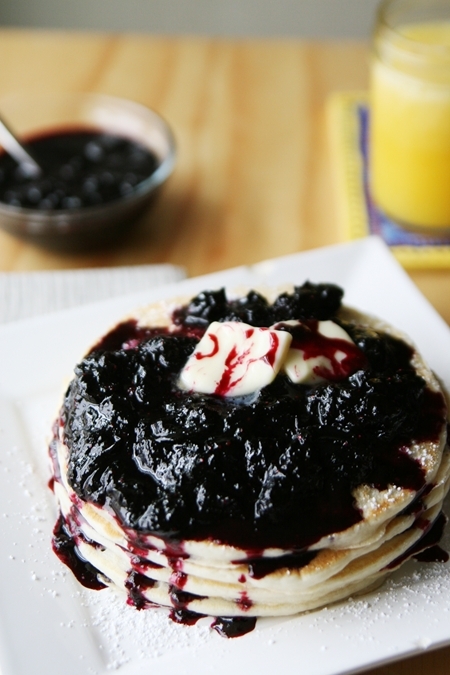 If you’re planning on making pancakes or french toast soon why not add some homemade blueberry sauce on top? This sauce will turn any simple breakfast into a special morning. Enjoy! 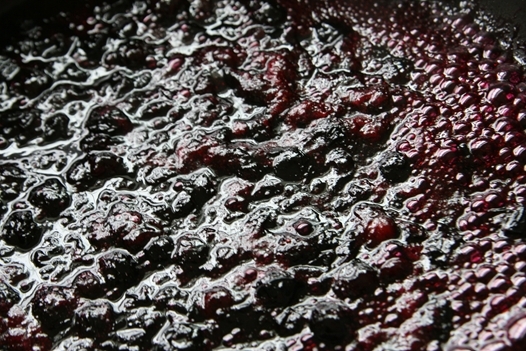 Cook blueberries, sugar, and water on medium-high heat for 10 minutes stirring occasionally. Turn heat off and stir in orange rind. Serve immediately while warm. Makes approx. 1 1/4 cups of sauce. Enjoy! Can leftovers be refrigeratored or even frozen? And if so how long will it last? this is so simple but divine… I am put this on cheesecake and Oh My was it Wonderful it is perfect !! Thank You so much …..I also love the pics that is what first got me ! Looks wonderful but I would never ruin a great blueberry sauce by adding all that sugar. Doesn’t anyone here care about their health? Fabulous recipe…just made it for the first sponge cake I have baked in over 20 years! Dang I’m older than I thought, but this recipe was perfect!!!! On http://www.marthastewart.com the blueberry recipe is refined to reduce the sugar and strain out the pulp for a refined smooth sauce. The recipe is two Tablespoons sugar, three Cups blueberries, one tablespoon fresh lemon juice, a pinch cinnamon (a healthy spice). I still think that the white sugar can be eliminated. Just cooked blueberries and a healthy sweetner is okay. 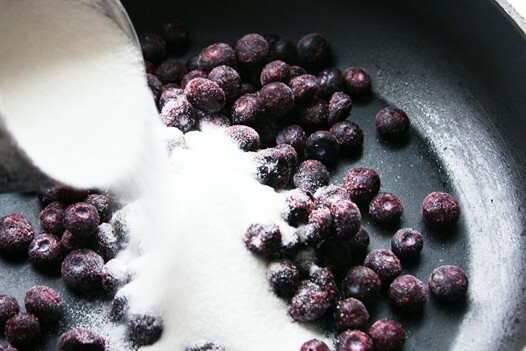 If you must consume white sugar, http://www.marthastewart.com/337597/blueberry-sauce, has a recipe with one-fourth cup suga, two cups blueberries, and one tablespoon fresh lemon juice. I do not see having a one to two ratio, one cup white sugar to two cups of blueberries, as healthy…you are eating carmelized sugar with a few blueberries. That is why the sauce looks like a lump of mud. The carmelized sugar is over-taking the blueberries. Remember, white refined sugar is considered unhealthy. Your family deserve healthy foods. The one cup of unhealthy white sugar can be replaced with raw or organic Agave. Blueberries taste great just cooked and no unhealthy chemical added. If the blueberries are too acidic, add Agave or a healthy sweetner. 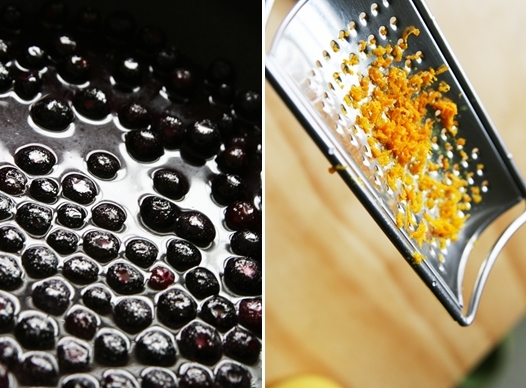 The blueberries make their own sauce without adding sugar, cornstarch, lemon, vanilla extraxt, zest, or unhealthy items.